Established in 2003, Myriad Interactive is a team of talented individuals who share a passion for creating interactive marketing and technology-driven solutions that provide measurable return on investment. Our mission is to help our clients improve the profitability of their online business through clever marketing and premium interactive services. With vast experience in internet strategy, graphic design and interactive development, Myriad is well equipped to help your company increase brand awareness, generate revenue and foster stronger relationships with your customers, employees and partners. 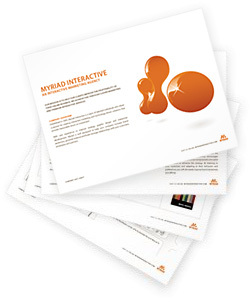 To learn more about Myriad Interactive and how we can help your company achieve its marketing and communication objectives, please contact us.